Looking back, I believe that the civil war in former Yugoslavia was one of the first world events I was aware of as a child. I still remember some images of it, that I saw in the news. 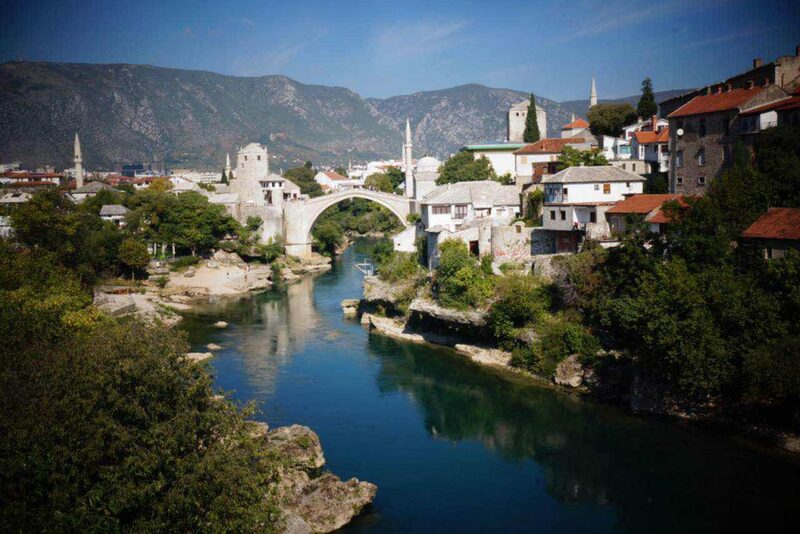 For me, a symbol of that war is the destruction of the Old Bridge, or Stari Most, in Mostar. So when we were planning a trip along the Dalmatian coast, I wanted to make a small detour to include a visit to Mostar and see its famous bridge, which was reconstructed in 2004. We rented a car, a white Seat with stickers “try me” on the sides, in Dubrovnik and drove to Mostar. We didn’t had a say in the brand, colour or stickers. Along the way we stopped in the Trsteno Arboretum and Ston, a small town renowned for its oysters and wall, also dubbed the European Great Wall. I must say that while walking on it and climbing the hill it was build along, reminded me of my trip to China and the real Great Wall. A big difference is that the wall in Ston is only around five kilometres long, and thus falls a bit short in the comparison. The oysters however are really good. The journey from Ston to Mostar is about ninety kilometres but it took us a little over two hours. 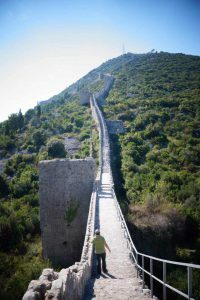 The shortest route includes three border crossings and a highway, we decided to keep it with one border crossing and take a scenic route from Neum to Mostar, driving on smaller roads through the mountaines landscape. It was beautiful and quite lonely, since we hardly saw other cars. A little after six in the evening we passed the city limits of Mostar. The guesthouse where we stayed for two nights is on the east bank of the River Neretva, in a narrow one way street. It took us a bit of effort to find, but it has a very central location, close to the interesting parts of the city. A young couple is operating the guesthouse and we were welcomed by the woman of the couple. She gave us some maps and told us how to get to the different sights. I found her genuinely friendly and helpful. The room was simple but ok, with a comfortable soft bed and good, hot shower. I really recommend this place if you’re looking for a place to stay in Mostar. At this time of year there are not that many tourists in Mostar, it’s not empty, but its less crowded than Dubrovnik. Maybe we were lucky, but the weather was great: blue sky and sunshine with temperatures going up to 28 degrees. Mostar is special in multiple aspects. It’s skyline contains the minarets of mosques and the towers of churches. Some houses still bear the marks of the war while others are renovated. On average the cars are older than in Western Europe. You notice that it’s a poorer city than Dubrovnik, Split or Zadar. But the people are really friendly. I’ve felt it not only in our guesthouse but also in a bar or in a small shop. The shopkeepers of the many souvenier stalls are also not pushy. Things are cheaper in Mostar: ice cream for 0,50€ a scoop, 2,5€ for half a litre beer with a view on the Stari Most, 40€ for two nights in our guesthouse. Ten kilometres to the southeast of Mostar is a small village called Blagaj. 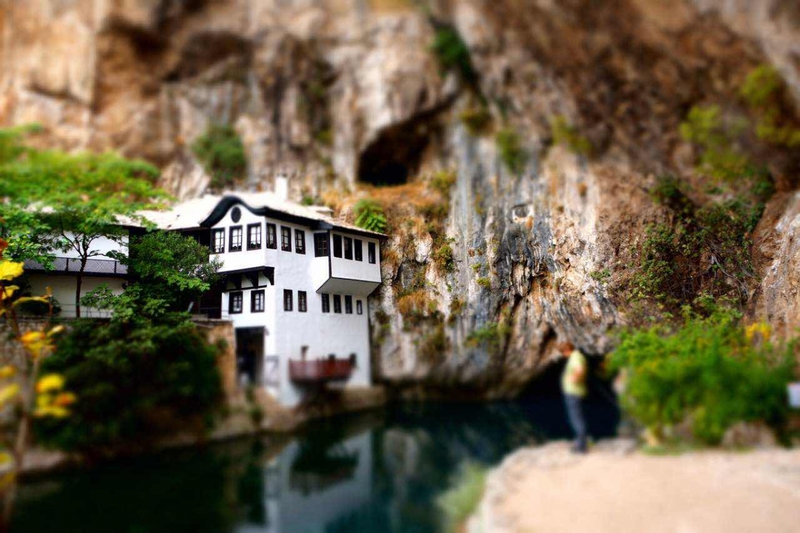 It is located at the spring of the buna river and is known for the Blagaj Tekjia, a Sufi lodge built around 1520 and now a national monument. The house can be visited and is quite nice.